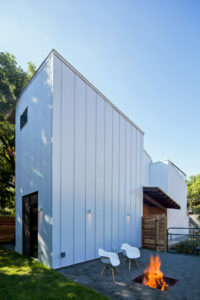 Haskell Health House is a modern abode in East Austin, a few blocks from Lady Bird Lake, designed by Jen Weaver of Weaver Building. Landscape by Studio Balcones. Yep! Sustainable design measures can save you money! Although it’s not my first time my work has been published on Arch Daily, it is definitely the first time under my own name! Read the article here. “The upgraded vapor barrier provides greater thermal comfort – keeping the air conditioner on 70F in Texas’ July, the energy bill was only $118 (1/3 normal costs for the same size space. )” I would add that focusing window and door penetrations on only east and north faces both optimizes day lighting and minimizes solar heat gain.